Forum introduces high school students to social justice issues. From the University of Windsor. Read the original article here. The High School Social Justice Forum held on campus Tuesday hit home for Madeline Doornaert. The grade nine student at Walkerville Collegiate Institute was one of about 300 students from local secondary schools to attend workshops on a range of topics, from civil liberties to democratic assembly, food security to First Nations issues, animal welfare to the rights of lesbians, gays, and the transgendered. The forum, on the theme “Democratic Rights in the Age of Austerity,” is the seventh in an annual series presented by Teachers for Global Awareness in partnership with the Centre for Studies in Social Justice. Its mandate is to introduce high school students to significant and challenging social issues and to promote activism and social consciousness in secondary school students and teachers. Co-chair Amy Tesolin said the event would be much more difficult without the partnership with the University. Tesolin said she expects some attendees to become social justice activists as they return to their schools to work on student-led community projects. “Every year, there are big projects that we try to encourage, but sometimes it’s the things we don’t expect that make the biggest impact, as they incorporate what they have learned into their lives,” she said. 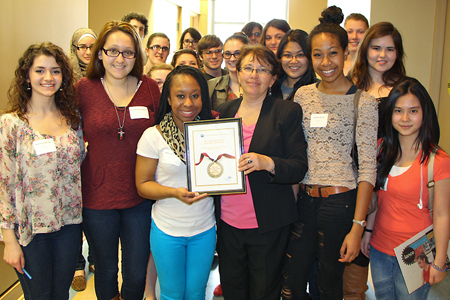 Students from Riverside Secondary School surround Rebecca Amoah, prime minister of the school’s student parliament, and Centre for Studies in Social Justice director Tanya Basok, as she presents the group with the Social Justice Project of the Year award for its community outreach program. Attending the 2012 High School Social Justice Forum inspired Rebecca Amoah. When she was elected prime minister of the student parliament at Riverside Secondary School, she dedicated her term to community outreach. That dedication was recognized Tuesday as Amoah and her schoolmates received the Student Project of the Year award from the Centre for Studies in Social Justice. collecting canned goods, household items and books for the Downtown Mission. It is a legacy of commitment to community, said Riverside’s principal, Mary Edwards. Tanya Basok, director of the Centre for Studies in Social Justice, said she was impressed that the activities extended beyond fundraising into many hands-on experiences. “This group of young activists certainly gave me hope that many forms of exclusion we witness in this society may soon be a thing of the past,” she said as she presented the award.